This weekend is the Autumn edition of My Garden Right Now. I took part in the early Spring (March) and Chelsea Fringe (June) editions, focusing upon my garden in pots. This time the focus is on resting in the garden. Due to a variety of reasons, my chronic illness, Myalgic Encephalomyelitis (ME), has not improved, and in fact I'm doing less in the garden than in May. This is very frustrating, but this is as things are, so I'm adapting as best I can. 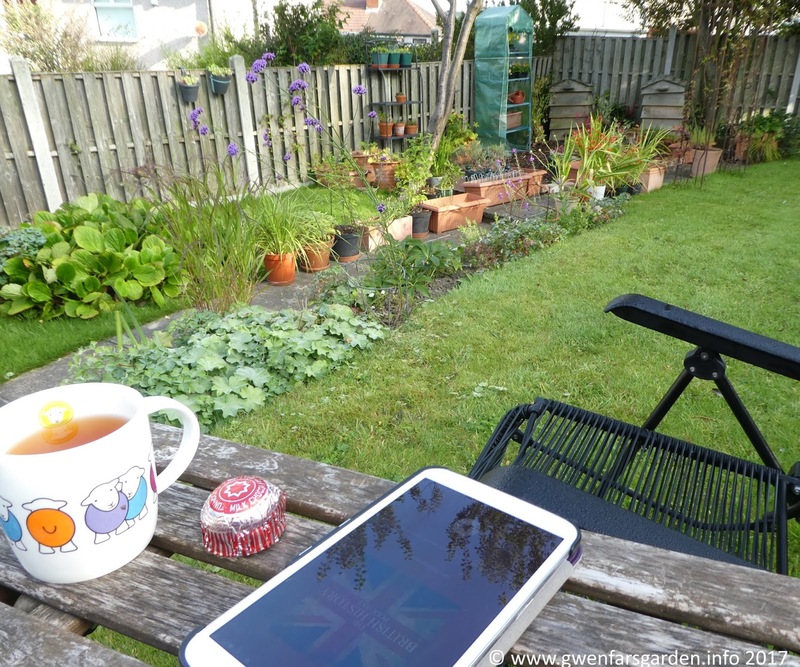 What I am doing regularly in the garden right now, is resting in my comfy chair with a cup of tea and a Tunnock's Teacake, listening to my favourite podcast, The British History Podcast, which is what the picture above represents. My garden right now is mainly a place of rest. It is a place of quiet enjoyment of two of my favourite things, being in the garden, and learning more about British History. It's a good place to be. I'd love to see your garden right now. Leave a comment with a link below and I'll come and visit! Hope you are having a beautiful week-end! Thank you Lea. You too.